Congratulations to Jenn and Lucy for a safe return back home! A big thank you to K9 Jake for your good work. 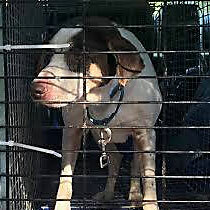 Lucy was finally trapped and is now on her way back to her nice air conditioned home! Yeah! It took a bit to get her to go into the trap but finally success!